Table tennis is great gun, as well as being a perfect way to help keep yourself and your family active. If you have looked around our website, you will see that there is indeed a huge range of tables available of all different types and budgets. Our table tennis buyer’s guide is here to explain all the types available and what special features you should consider looking for in each model. Let’s go through each of these common features first. The table’s playing surface is the main surface you play on whilst the table is in use. It’s definitely what sees the most action, and many aspects go into dictating how the table overall will play - most importantly, the table’s thickness. The thicker the table, the better the bounce. Plywood is used on indoor tables, whilst melamine is found more frequently on outdoor designs. Melamine can even be treated in various ways to increase its strength further, by reducing wear, or improving the wear-resistance. The table’s supporting frame is what holds your playing surface. That’s essentially it. The premise is very simple – The thicker the supporting frame, the stronger the table will be when it comes to play and transportation. A table’s carriage type dictates how the table is moved around (or isn’t) once it’s installed. The three main types are split carriage, single carriage or standalone. A split carriage table sees the playing surface split into two pieces, with each half either having a wheeled base to move it around, or foldaway legs to keep the table flat. When in play, the table is folded out, put together and then the brakes are applied. The net is then attached afterwards. To store the table, the nets are removed and the surfaces are brought vertically. This allows the two halves to be brought together to store away. The sleek design allows these tables to fit through most doorways easily. Ideal for indoor use. A single carriage design is arguably one of the more common types of carriage system seen on table tennis tables. They’re very easy to explain – The entire table is built as one unit that keeps both halves of the table together, but folds vertically for storage. These tables all come on wheeled bases for easy transportation of the table, and can include several useful features such as foldaway nets and accessory storage. Keeping both halves of the table together is better for convenience, and makes the whole table easier to move. Whilst convenient, the table’s folded size is significantly larger than a stored split carriage, meaning that the table may struggle to fit through standard doorways. A standalone table is exclusively used for outdoor models, and is the most hardwearing table type with the toughest playing surfaces, metal nets and strong supporting frames. The table is similar to pool tables in that once installed, they are not moved, and kept permanently in one location. These tables are built to last, and incorporate a lot of protection into their designs to enable them to be installed in and withstand the toughest of environments, and any weathers. The tables can even be bolted directly to concrete for added security. For that reason, these tables are popular choices for public installations, especially in places like parks, schools or leisure centres. Incredibly strong tables. Designed to take a lot of punishment and remain in place all year round. Tables often pack several other features in that are also important to consider when purchasing a table tennis table. We’ll detail some of the more common, but important ones below. Every table will have varying degrees of safety features, but key ones to look for include brakes on wheeled tables, and corner protectors on the supporting frame. Brakes are essential on wheeled tables to keep them stationary when playing, and to prevent them from moving unexpectedly during storage. Corner protectors limit injury to anyone who happens to catch the corner of the table whilst passing or walking around it. Wheels will definitely make transportation of your table easier, but if buying a table for outdoor use, then try and find a model with larger and more rugged wheels. Larger wheels will make transporting the table over uneven terrains much easier, especially over surfaces like grass or gravel. Primarily found on single carriage tables, accessory storage allows you to keep all your table tennis gear in one easy to reach place. Bats and balls storage is common, and some tables even feature ball dispensers at each end of the table means players don’t have to wait to start the next round. With the basics out of the way, here are some more specific things to look for on each style of table. Indoor tables are used at the competition level of play, and offer an excellent game and several storage options. Before going into some specifics, it is important to consider where you will store and use your table. 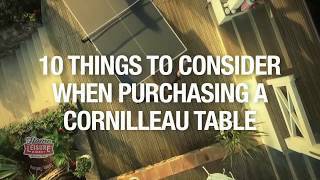 If you intend on using your table in a place where climate changes frequently (like a conservatory or a garage) then seriously consider investing in an outdoor table instead of an indoor table. The plywood playing surfaces of indoor tables are very sensitive to these kinds of climate changes, and could be affected by the changes in moisture or heat. Outdoor tables however are much better geared to stand up to these kinds of changes, and will last much, much longer. Indoor tables will normally wheel away on a wheeled carriage, or simply fold away for easy storage. See our guide above on carriage types to see the various folding mechanisms that tables can come with. Another excellent space saving solution are table tennis tops. A table tennis top sits over the top of any table, transforming it into a fully sized table tennis table in seconds. Whilst excellent for storage, this option does still provide users with a full-sized table tennis surface, so make sure you have the recommended 3 feet envelope around the table to allow you to play effectively. Outdoor tables are very tough, and offer a wide and varying selection of additional features to help them to better suit their environments. Like indoor tables, most outdoor tables (aside from the permanent standalone tables) will fold away to a smaller footprint to make storage much easier, whilst retaining the ability to be wheeled wherever you need to for storage, or for setting up play. When not in use, foldaway outdoor tables are protected by a large weatherproof cover to keep the table inside protected from the elements. All manner of additional features are available on outdoor models. If playing somewhere like a garden or similar, look for features like adjustable legs to help level the table. Equally, look for special coatings or treatments to the playing surface to improve durability like the hardwearing Mat Top or the glare reducing Soft Mat coatings from Cornilleau. The choice doesn’t stop with indoor and outdoor tables. If you have a very specific requirement for your table, then one of the following options may also be appealing. A full size table tennis is a large thing, and if you don’t intend to play outdoors or don’t otherwise have the space required then most options may appear too large to consider. In cases like these, look at a mini table tennis table like the Butterfly Junior. The Junior uses many of the same components as a full sized table, but at ¾ the size is much more accommodating for smaller spaces. If you’re looking for an additional twist to your game, then it’s worth investigating the range of tables produced by T3. The T3 tables turns the established rules of table tennis on its head, and offers a brand new experience for up to six players to play simultaneously. We recommend checking out our videos on T3 tables to find out more. After all of this, delivery of a table tennis table is one of the most straight forward parts. Virtually all manufacturers carry plentiful stock of all table tennis models, and depending on your location can be delivered to you in a very tight time frame. Normally ranging from 2-5 days from the point of order. For detail about any of our available tables, check out any individual listing for complete details on any table is available to view on each individual listing, and our team is just a phone call away to answer anything you may wish to ask.